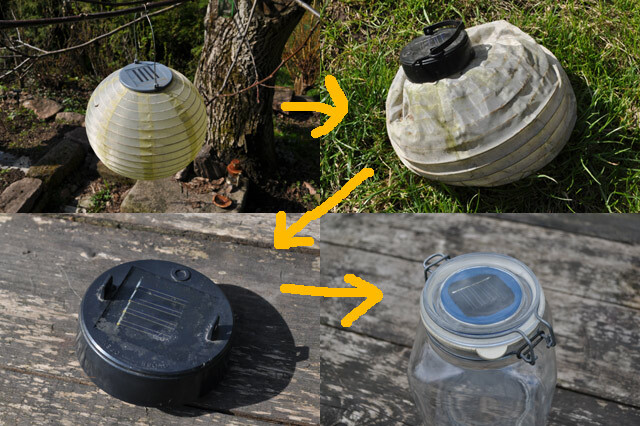 Mason jar light: DIY solar jar from an old solar light! So a while back you bought a solar lantern (maybe like the one I have, a SOLIG Solar Powered Globe from IKEA) which you hung on some branch. Nice! It did its job excellent but after a year or two the lantern looked like it had its best day. Maybe it doesn’t even work anymore… This is what I did with mine: I took out the solar part, put in a new rechargeable battery, and put it in the lid of a glass mason jar! It is really easy to do with the help from a little hacksaw to make it fit in the lid, some glue and some old paint (not required). 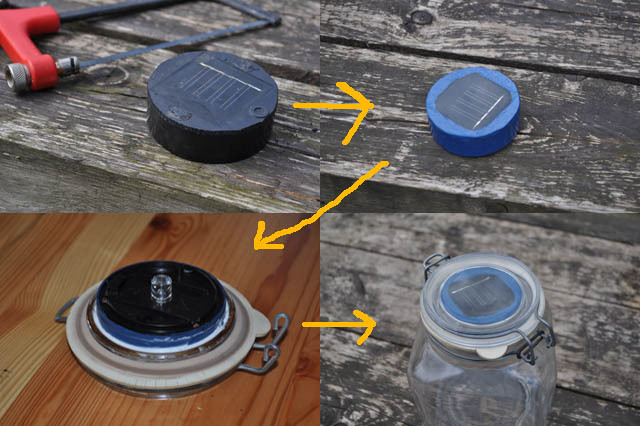 Basically you can use any (old) solar panel, if it is round and (almost) fit in a lid of mason jar, you’re all set. Mine even fit on a normal pickle jar, so just poke around the house to find what you can use. Solar lights automatically turn on when the amount of sun light falls below a certain threshold: the cells stop producing power and the photoresistor inside turns on the little LED light. So if you want to check the battery, cover the solar panel with your hand or move it to a dark place. Since mostly all (cheap) solar lights are equipped with a low-quality battery chances are that the LED isn’t working anymore or very faint. I mean, why are some solar garden lights cheaper then the average rechargeable battery? Exactly. So these batteries won’t last long and you’ll end up with either a dead solar light or one that is flashing all the time. Best is to change the factory battery (usually have only one color, green or yellow, no manufacturer mark) for a more common rechargeable one. Preferably with more amps so you’ll have more juice after it is charged. In my case the panel had a 600mAh battery which I changed for a 700mAh. But don’t worry, if you don’t have another one and the old one is still working, skip this step! You can always change the battery later. Don’t forget you can’t use regular alkaline batteries! They have to be rechargeable, like NiCads. 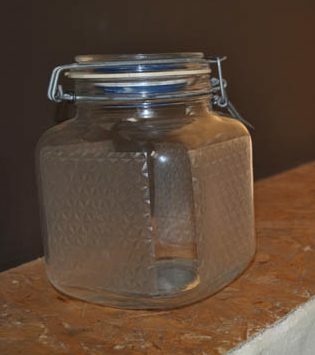 Now if you’ve found a mason jar or any other jar, try to fit the panel in the lid. You can always use a hacksaw to adjust the size. In my case I only had to saw off the edge. Paint it with some old paint, doesn’t really matter what kind, and after drying put some glue on the edge and glue it into the lid. Done! Now you only have to decorate it with for example frosted paint or foil, or put some water in it, or some dirt with a little flower, etc. etc. I glued a piece of aluminium foil on the bottom to have more light and I use mine as a night lamp, so guests won’t break their necks or legs when trying to find the bathroom 🙂 Also ideal for kids who want a night lamp. 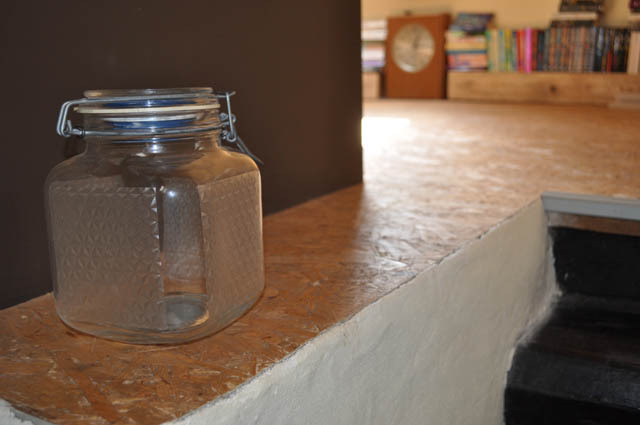 For a more extensive step by step, read this sun jar article. Don’t you have empty mason jars lying around or don’t want to DIY, then get a ready-made mason jar light at Amazon or eBay.